A small to medium-small fern with distinct and distinctive fan-shaped or wedge-shaped leaf segments, found mostly in western coastal sites on calcareous rocks; also naturalized on walls in frost-free situations. 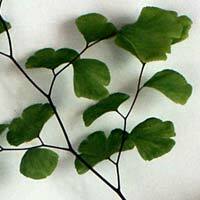 habit: often pendulous and hanging from vertical or near-vertical surfaces, or erect when growing in horizontal situations such as limestone pavement. Plants develop in loose clusters from a short, creeping rhizome, and generally die back in winter, but may remain green in sheltered sites. size: up to 30cm (rarely up to 45cm). leaf: fan-shaped to wedge-shaped; pink to reddish when young, bright pale green when mature; technically 1-3 pinnate, the individual pinnae looking like separate leaves, each more or less notched on the outer edge, quite variable in size as well as amount and depth of notching; ends of fertile leaves folded under to form indusium; ends of sterile leaves more or less crenate (round-toothed) as well as notched; veins fanning out from base of pinnae, evenly branched, without midrib. rhachis: fine, black to dark brown, shiny. stipe: fine, black to dark brown, shiny, with a few scales near the base. scales: at base of stipe only, dark brown, latticed (clathrate), narrowly triangular and attenuated. sori: towards margin of pinnae, at ends of veins. indusium: formed from the folded over ends of the pinnules. spores: 3-sided (trilete); no perispore (thickened outer layer). identifying features: overall appearance is highly distinctive and unlike any other native British or Irish fern. Fan/wedge shaped leaf-segments, and rolled-under segment margins forming "false" indusia. Fine blackish stipe and rhachis. habitat: on damp calcareous rocky substrates in mild, frost-free environments: natural sites include sea-cliffs away from direct spray, and limestone pavements near the coast; man-made ones such as mortared walls - often found self-sown on brick bases of greenhouses. range: South-western coastal areas of Britain from Dorset west and north to South Wales; Cumbria; Isle of man; Channel Islands; western coastal areas of Ireland as far north as Donegal, also Kilkenny; naturalized in man-made habitats, often away from the coast in damp, frost-free environments. Distribution map from NBN Gateway. Scroll down for datasets used to compile map. Plant, escape from cultivation, naturalized on walls at Oxford Botanic Garden Plant, escape from cultivation, naturalized on walls at Oxford Botanic Garden. Note small frond of Pteris vittata (Ladder Brake), lower right.